The combination of toasted marshmallows, crispy graham crackers and melting chocolate is what makes s’mores a beloved summertime treat of so many. Classic s’mores are made over a campfire, but you can capture the flavor of a s’more in different types of baked goods and desserts by using the same building blocks in a different way. A S’mores Layer Cake is a great example of this. 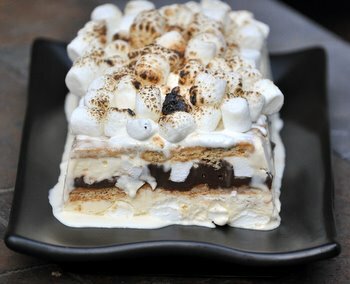 This S’mores Ice Cream Terrine, which is another type of layer cake, is another. A terrine is usually a savory dish, a molded pate that often has layers of vegetables, meats or other ingredients in it. 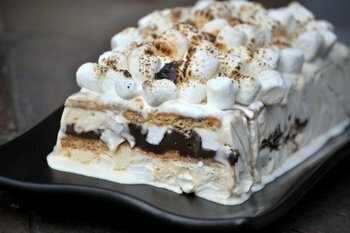 My S’mores Ice Cream Terrine is much sweeter than your typical terrine, but is is molded in a very similar way and has layers of many different ingredients. The dessert is something that is very easy to assemble and can be made well ahead of time and stored in the freezer until you’re ready to serve. It makes a great no-bake icebox cake for summertime parties when you don’t want to heat up the kitchen by turning on the oven. The terrine is made in a loaf pan by putting together layers of graham crackers, vanilla ice cream, chocolate fudge sauce and mini marshmallows. More mini marshmallows are added top the top of the terrine just before serving and bruleed with a kitchen torch (or under the broiler, if you’re quick about it!) to add that toasted marshmallow flavor. The amounts I’ve given below are more of an estimate and are not exact, because even fairly “standard” loaf pans vary a bit in size and you might want to make your layers thicker or thinner than I did. No matter how you stack things up, though, you’ll get a delicious s’mores dessert when you finally pull this out of the freezer. Line a loaf pan (pref. 4×8) with a lightly greased sheet of plastic wrap. Place a single layer of graham crackers on the bottom of the loaf pan, covering the entire base. You may need to break some of the crackers to fit. Fold 1 cup of mini marshmallows into the softened ice cream. Reserve remaining mini marshmallows for topping. Spread 2 cups of ice cream mixture on top of the graham cracker layer and spread evenly. Drizzle fudge sauce over the top of the ice cream layer (you may need to warm it slightly in the microwave) and spread into an even layer. Place another single layer of graham crackers over the fudge sauce. Spread remaining ice cream into an even layer on top of graham crackers. Cover with plastic wrap and press down firmly, but gently. Freeze for at least 2 hours (and up to 2 weeks). When ready to serve, unmold the terrine and remove plastic wrap. Place smooth-side up on a serving dish. Spread a thin layer or either hot fudge sauce or marshmallow fluff on top as glue for topping of the remaining 1 cup of mini marshmallows. Lightly go over the mini marshmallows with a kitchen torch to brown them lightly (or carefully put them under the broiler for 1 minute – but do not do this if your ice cream is very soft!). Slice with a sharp knife and serve immediately. Of all the riffs on s’mores these days, I have to say, this is the absolute best! Oh. My. Goodness. This looks absolutely decadent! I’ve been making a lot of s’mores themed desserts lately, but this one completely blows mine out of the water. 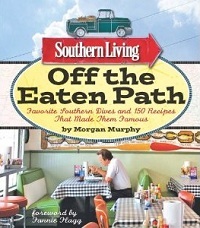 I’m going to have to make this soon. OMG, this looks amazing! So delicious!!! 🙂 Great idea! One bite of that and I could die a happy girl! 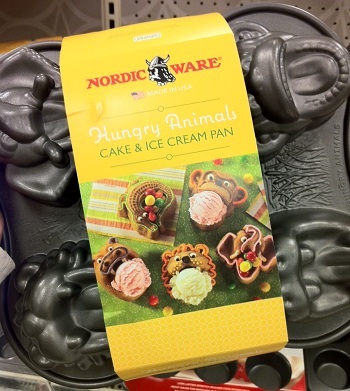 And just for the record…this WILL be my birthday cake this year!!! Oh wow, we love this! Any way we can get that s’mores taste…and you added ice cream!? DIVINE! This looks amazing! I love ice cream desserts of any sort but this is one of a kind! I love the smore combo and to put it with ice cream is genius! I pinned this to try this summer for sure!